2D meets 3D world. What is real here? -Everything! 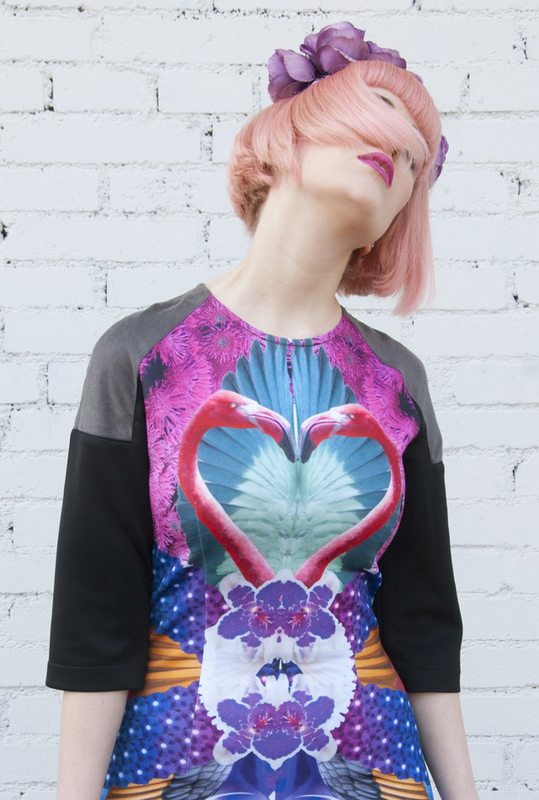 The heart of the flamingos on my breast beats for the pink handbag. I can't get my hands of it too. 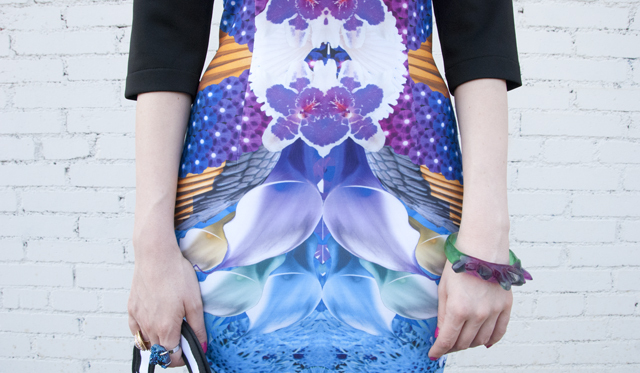 Loving the psychodelic print of this dress and playing with my pastel hair. "Comic Lovely Sara" is what I feel like with this bag. Orchards, lilies and my favourite resin bangle are a winning team. 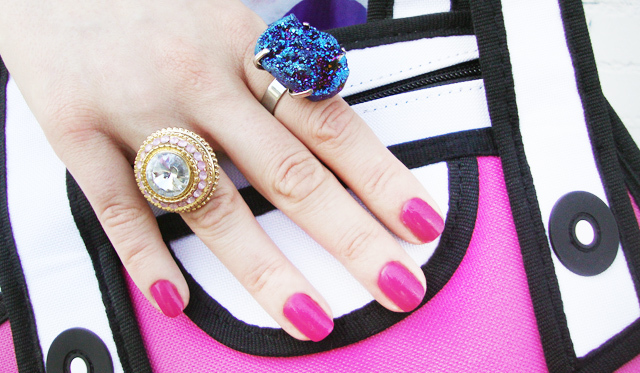 The playfulness of the handbag is inspiring me. 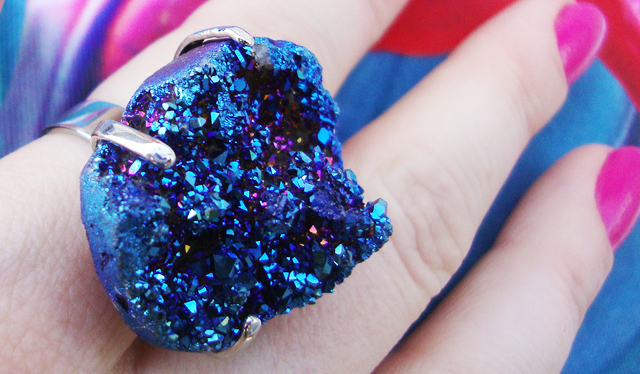 Imagine this stone came from a planet far, far away, where the whole surface is blue and shiny. Sweet, sweet confusion! 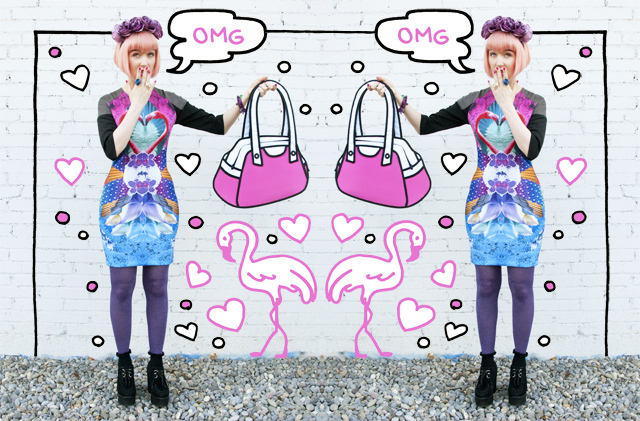 Today I am tricking your eyes with a psychodelic all over print and a handbag that is almost too good to be true. This outfit is a declaration of love to Asian fashion: The dress comes from Thailand/London based label Lalalove (Yes, I couldn't resist to buy it after I told you about it) and the bag from Taiwanese label JumpFromPaper. I love the creativity and playful quirkiness Asian designers often display in their work. If I find a new label from this part of the world that satisfies my urge to be a walking rainbow, I always get very excited and feel like a little fashion explorer. JumpFromPaper wasn't actually found by me, but rather I was found by them. When they contacted me, I couldn't believe I didn't hear about them before, because my style is literally made to fit these bags. I already wrote a post about the label here if you are interested to learn more about them. When my very own JumpFromPaper bag arrived, I instantly felt that we were gonna be very close friends. The quality of the bag is excellent and it's super flat. There is a zipper at the bottom of the bag and when it's open the bag gets a lot more roomy. Enough space for the things I carry around in my everyday routine is provided. The bag gets a lot of looks and compliments. Isn't it a wonderful achievement for a bag to make people smile? This makes my flamingo heart beat faster for sure. What do you think about this outfit and are you amazed by Asian labels too? Thanks to JumpFromPaper for the beautiful bag. Jaha, darauf habe ich gewartet. Njaa...bei mir wirds entweder noch laaange dauern oder daraus wird gar nichts. Ich weiß noch nicht, ob ich mir eine Tasche bestellen werde, auch wenn ich sie echt gerne hätte. Du weißt nicht zufällig, ob sie mit DHL versendet wird? Im Gegenteil, DHL ist fantastisch! Ich hatte letztens so arge Probleme mit Hermes, deshalb habe ich nachgefragt. Die sehen von Nahmen wirklich sehr hübsch aus, leider sind sie momentan ausverkauft. 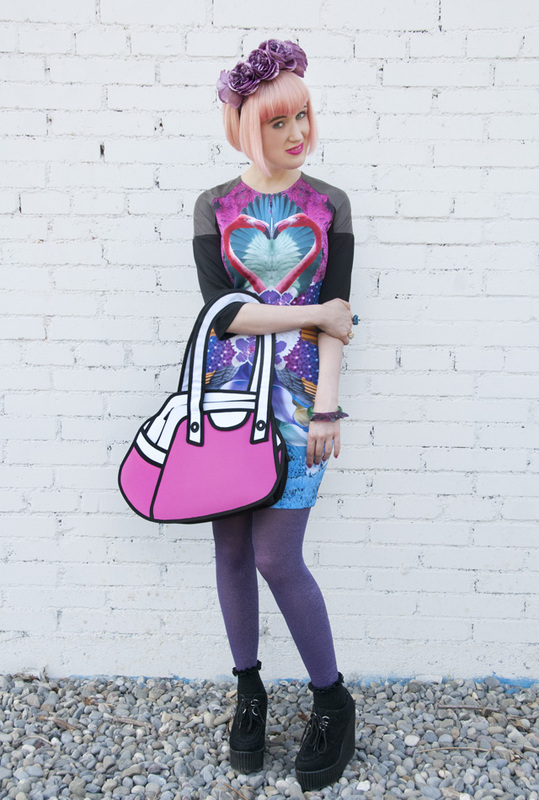 I have that same bag from JumpFromPaper -- it's amazing!! And this dress is lovely on you. It reminds me of Lisa Frank! Your outfits are impeccable!